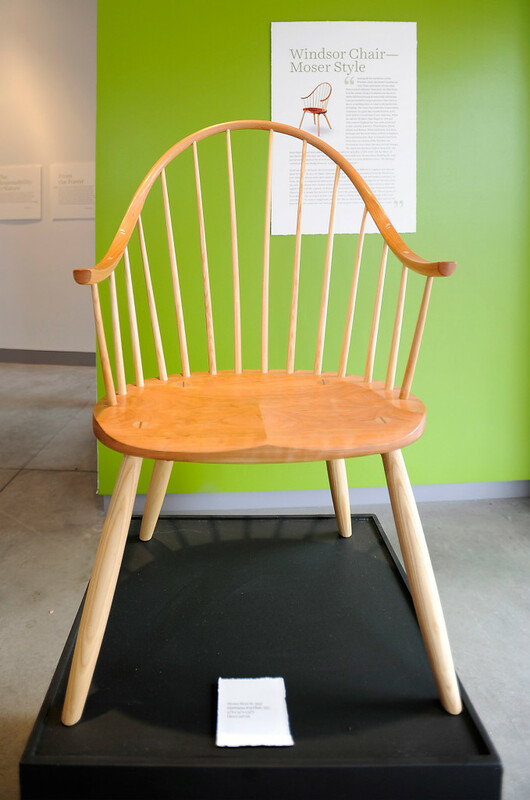 An exhibition at the Maine College of Art tells the furniture creator's story with examples of his work and tools. Among the dozens of objects made by Thomas Moser in a new Portland exhibition, only one is meant to be purely admired. It’s a wooden American flag, pieced together with scraps from the Thos. 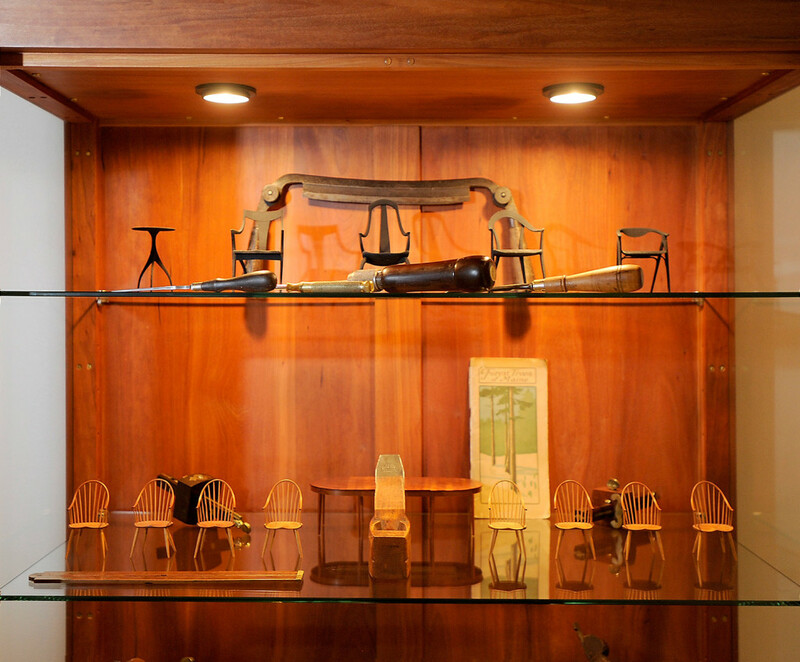 Moser shop in Auburn, where Moser and his associates create finely crafted furniture. Moser made the flag this year in his putzing-around time, which he’s earned plenty of after 44 years making furniture. He made the flag with black walnut from Missouri, black cherry from Pennsylvania and maple from Maine. WHEN: On view through Sept. 20; 11 a.m. to 5 p.m. Wednesday to Sunday; until 7 p.m. Thursdays; and First Fridays until 8 p.m. 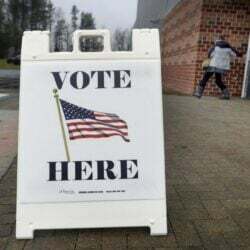 The flag is a lot like Moser’s furniture: understated, simple and elegant, respectful of the material and expressive of his artistic vision and flair. Moser is almost bashful that it’s part of this exhibition, “Thos. 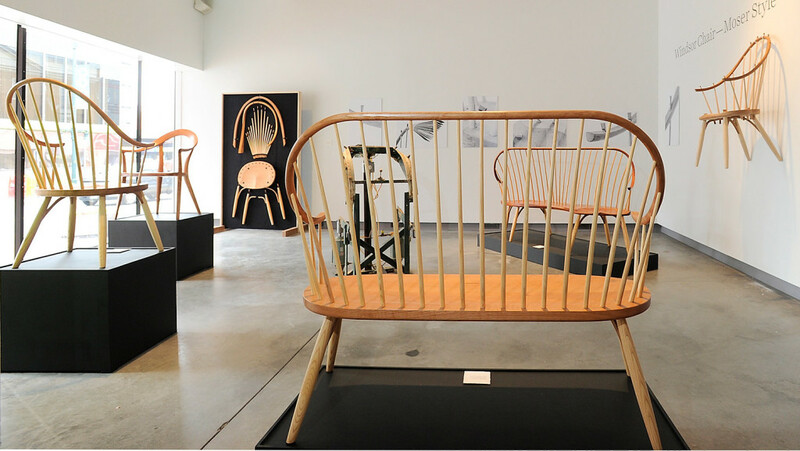 Moser: A Legacy in Wood,” at the Institute of Contemporary Art at Maine College of Art. His intent wasn’t to make art, but to use the scrap produced at the shop. Moser has never intended to make art, in any form. The exhibition and book survey the life and career of Maine’s most recognized and successful craftsman. 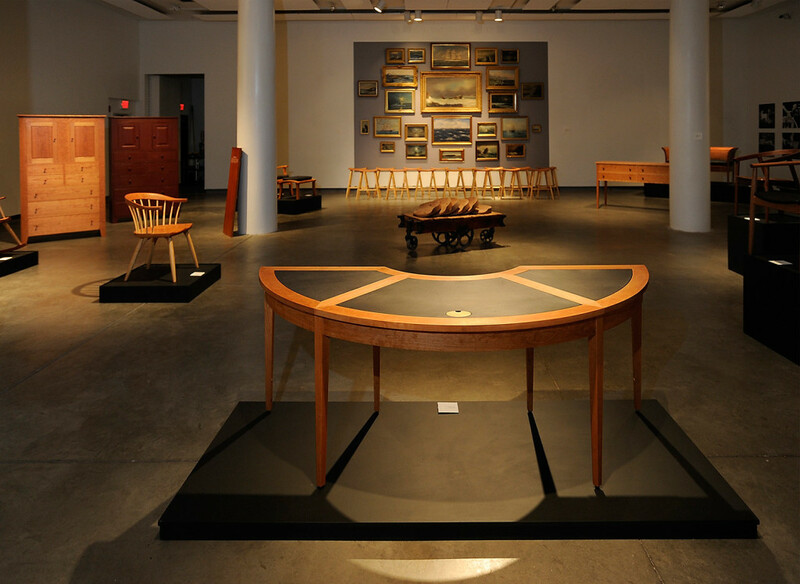 In a state known for its woodworkers and furniture makers, Moser is the father of Maine’s fine-furniture renaissance that began in the early 1970s. 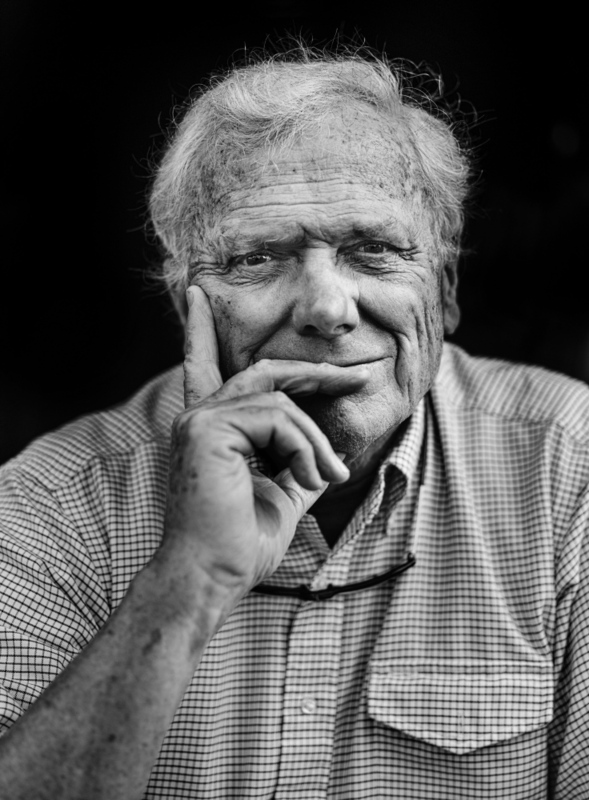 Moser and his wife, Mary, were raising a family of four when he quit his teaching job at Bates College to make furniture, in 1972. 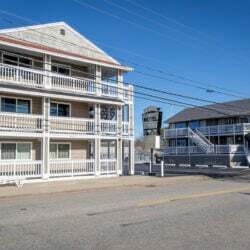 At first, it was a leave of absence, but that led to a modest small-business loan and a workshop in New Gloucester. Forty-four years later, the company operates a massive workshop in Auburn, employs hundreds and sells high-end, handmade furniture across the country and around the world. The odds were against Moser. His parents died when he was a teenager, both from cancer – his mother when he was 14, his father when he was 18. Moser quit school and joined the Air Force. After the service, he got into college based on his veteran status, and he flourished. 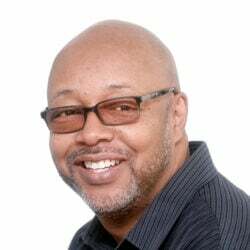 He earned three levels of degrees, including a doctorate in speech communications. He moved to Orono in 1966 to teach at the University of Maine and soon after to Lewiston to teach at Bates. He was a tenured professor and well into fatherhood when he left Bates to pursue his desire to make things with his hands. He and Mary had built a modest cottage together during their college years, and that sparked in Moser a desire to design, create and build. Age and confidence gave him the ability to make it happen. 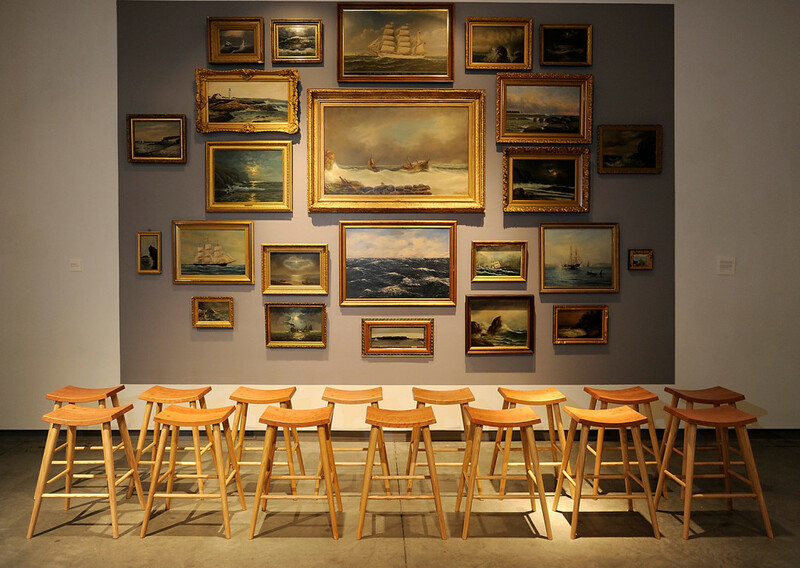 In the large back gallery of the Institute of Contemporary Art, McNeil hung two dozen paintings of maritime art on one wall, salon style. Moser and his wife have collected maritime art for many years, reflecting their love of sailing and the sea. Moser was a trustee at Maine Maritime Museum in Bath from 1986 to 2003. All these paintings are unmarked, by painters unknown or uncredited. Nearly all were amateur Sunday painters, who came to Maine to capture the poetic allure of boats on the water. McNeil wanted to include a sampling of the private collection to personalize the show. 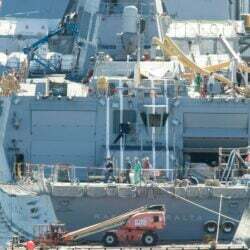 “I think it says a lot about the man, and it says a lot about his love of Maine,” McNeil said. 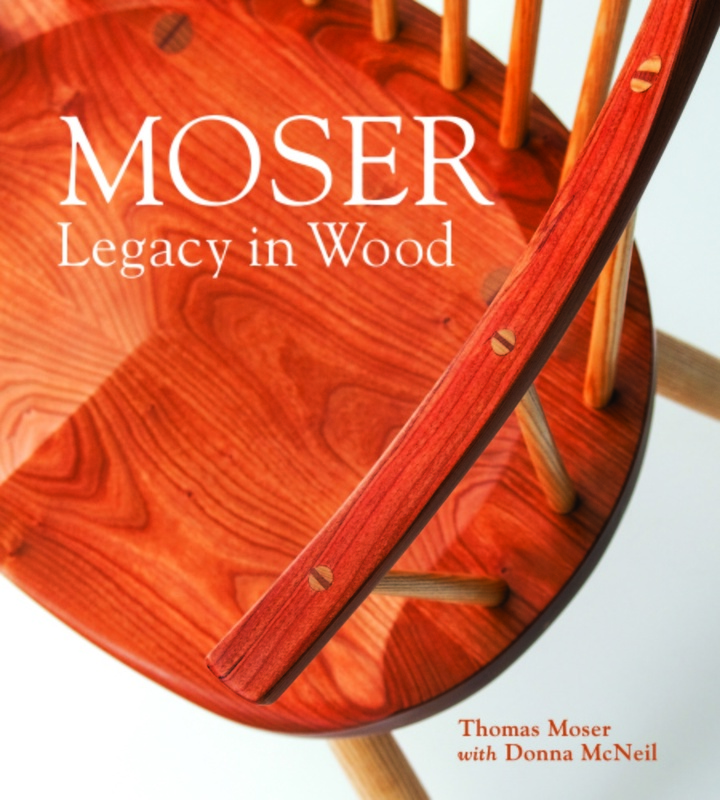 “A Legacy in Wood” tells Moser’s story with examples of the furniture he’s made, including the evolution of key pieces; video interviews from throughout his career; the tools that he’s used over time; framed copies of the patents he holds for his designs; and other elements of his trade and life. 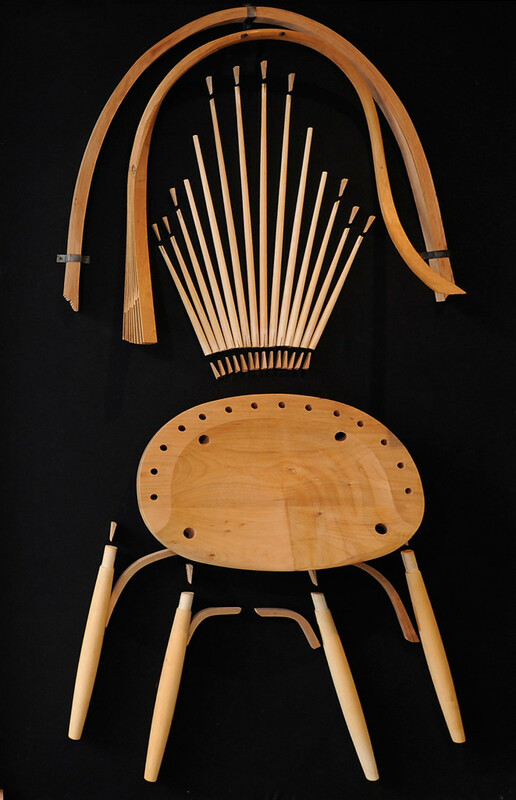 Moser made his reputation with his version of the Windsor chair. He admired the simple life and lifestyle of the Shakers, and he emulated their reductive aesthetic in his design. He polished his chairs to show off their natural grain and colors of the wood. Likewise, he left his joinery work exposed, showing not only how he made the chair and how the pieces of wood fit together, but also asking for an unspoken trust from the person who is about to sit on it, a trust that the chair will hold and this experience of sitting will be rewarding and comfortable. 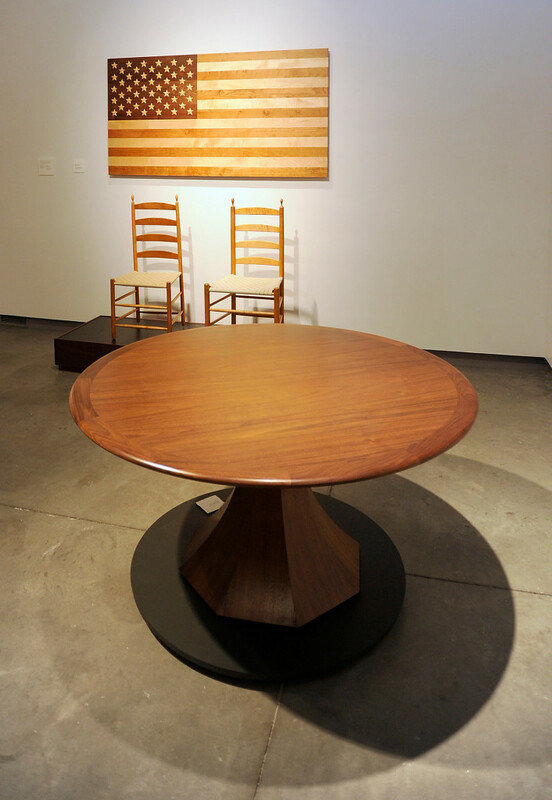 Moser’s tables are beautiful, his desks are presidential and his Windsor chairs weep with elegance. 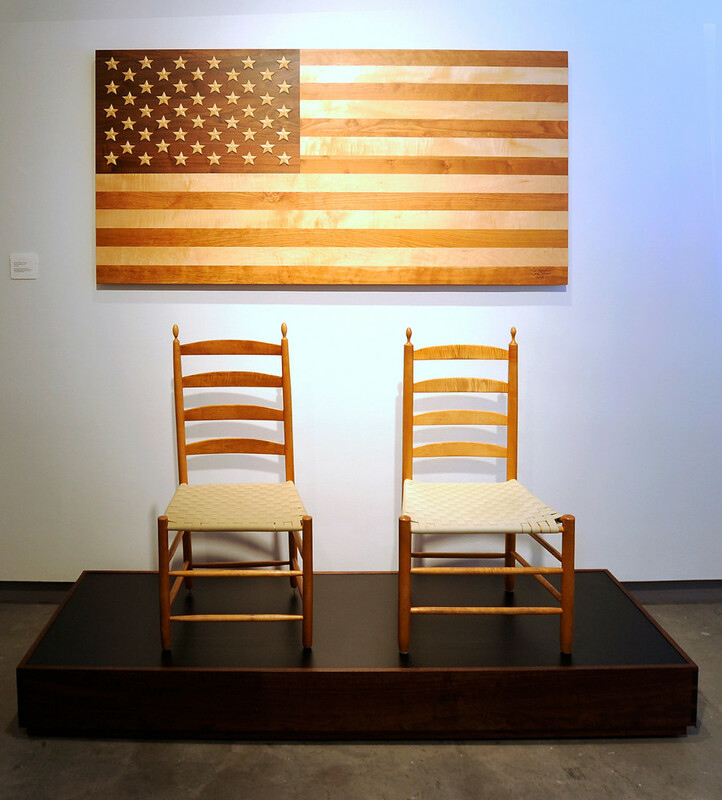 In the front room of the ICA facing Congress Street, McNeil shows a Windsor chair taken apart, its pieces laid out ready for assembly, like a skeleton. It looks so simple, so logical. Moser makes things in a traditional way while embracing technology. McNeil includes in the exhibit a hydraulic press that Moser uses to shape wood. In one display panel, she quotes him as saying that he wrestled with incorporating power tools and technology. 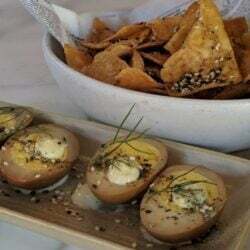 “However, power tools were and are adjuncts to craftsmanship, not the other way around, and I offer no apologies for the labor-saving choices we have made,” he told McNeil, noting that the Auburn shop uses three computer-controlled routers. 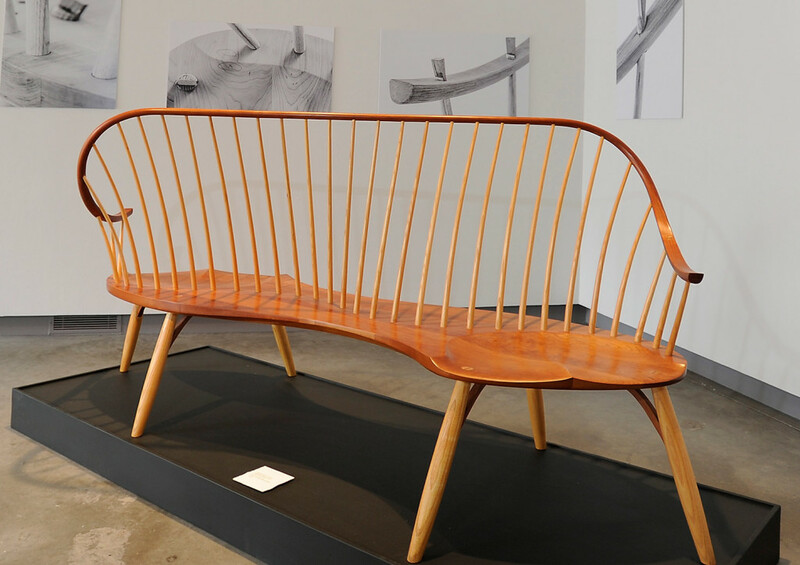 Maine College of Art President Don Tuski wanted the college to host the exhibition because Moser’s story offers students an example of an artist-entrepreneur who is based in Maine and sells furniture worldwide. 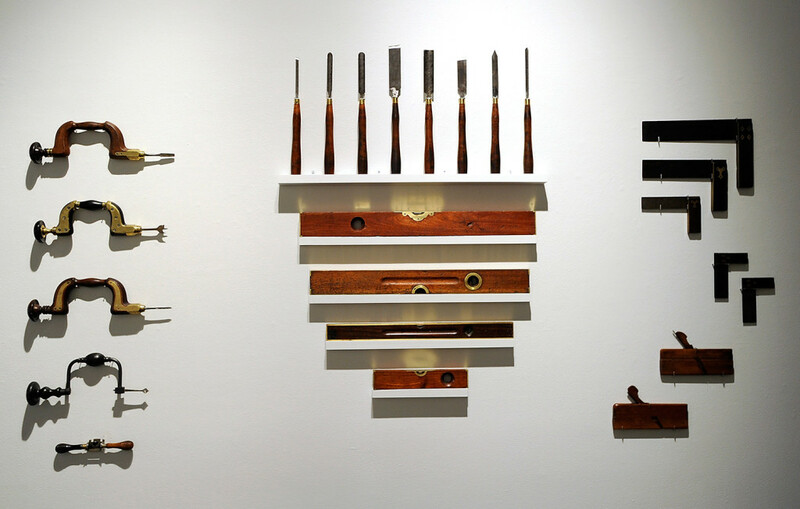 The exhibition also calls attention to the school’s woodworking major, Tuski said. MECA graduated its first students in woodworking and furniture design in 2004, and has about a dozen majors each year.